Even since the haze started and gotten dangerous. The air purifiers went out of stock. Price of mask has reached all time high. Even spa salons offer the precious N95 mask for free with purchase of their spa package. 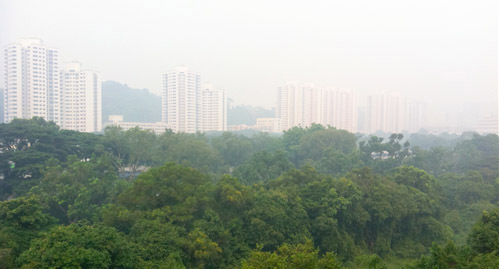 We are told to stay indoors to prevent exposure to the polluted air. But what can we do when we have no air conditioner or air purifier indoors?! After much research, my boyfriend and I discovered that we can fix up an air filer with household items while keeping ourselves cool. Concept of Air purifiers is to trap the particles in the air on the filters paper. This means lower concentration of air pollutants will get into your body. We applied this theory and we used a fan cover to attach the filter papers to an electric fan. DIY Home Air Purification System with fan cover and floor cleaning sheet. Place the suggested air filters between the fan cover and the fan. These materials are cheap and easily available. A low income family can afford it. here is another version of DIY Home Air Purification System. Use a chair as the frame of the filters. 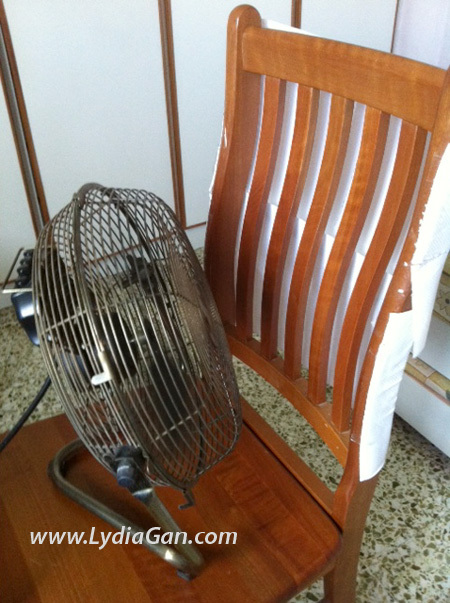 Stick the suggested air filters on the back support of the chair. The other important key to reducing the air pollutants in your house is to keep the windows closed. When there is an opening, use a wet towel or masking tape to seal the area. Put few pots of plants indoors to generate oxygen. Hope these simple ideas helps to relieve us from the discomfort of the Haze and make the air in our home more breathable. It will be fun project for parents to engage their kids in too. Avoid pouring cold water down your throat as it may induce cough in this harsh weather. To strengthen immunity, especially our lungs. Hide from the harsh and dry elements. Exercise at home or in the gym instead. As the filter would be working doubly hard these few days. For natural fresh supply of oxygen in your room. Let the wet towel absorb the burnt particles in the air. Thanks to the wonders of technology, we could clean the air we are breathing at the press of a button. Do get those with filter papers that will trap the dusty air particles. Do prepare eye drops in case the dryness stink your eyes. Why let the haze dull us up?! Now is the best time to shop for a comical mask. Or decorate our medical mask to cheer everyone up! While Apple has taken the world as a leader in technology advancement. The original apple from the garden of eden is just as popular! Apples are an amazing source of vitamins, antioxidants and fiber. Anyone with a little cow sense is aware of its goodness. I wonder, should we devour the crunchy apple with or without the skin? I did a little experiment yesterday by leaving an apple overnight at the balcony. Before that I rinsed the apple with running water briefly. The next morning, 2 birds flew in and ate it. Both took turns to guard and eat the fruit, very supportive teamwork. The 2 hungry birds ate all the flesh but left 3/4 of the skin and apple seeds. I can understand why birds prefer not to eat the seeds as it contains Cyanide which is harmful to them. But what about the skin? It contains fiber and nutrients too. I gathered, the only reason they bite off the Apple's skin was to gain access to the flesh of the apple. They avoided eating the skin as it was coated with pesticides and sealing wax! Washing the apples under a running tap does not remove these toxins! If these wild wise birds has the instinct to know what not to eat, we humans better take note! 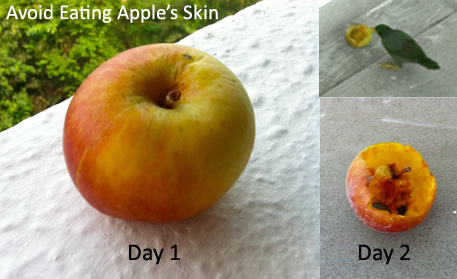 Apple-eaters, if your apples are not organic, do take time to peel off the skin if possible. Personally I prefer eating apples without the skin as I find the skin hard and tannin. If you prefer to eat your apples whole, do wash them thoroughly.